Garnet Hollyhock (Alcea rosea var. red and var. nigra) – Invites you to access the heart of the Milky Way Galaxy through the gateway of your higher heart. Supports you to live from this expanded higher heart-centered awareness. I AM connection to the heart center of the Milky Way Galaxy. Hollyhocks are a well-loved garden ornamental plant with tall stalks and multiple trumpet shaped flowers. Hummingbirds are drawn to the brightly colored flowers. 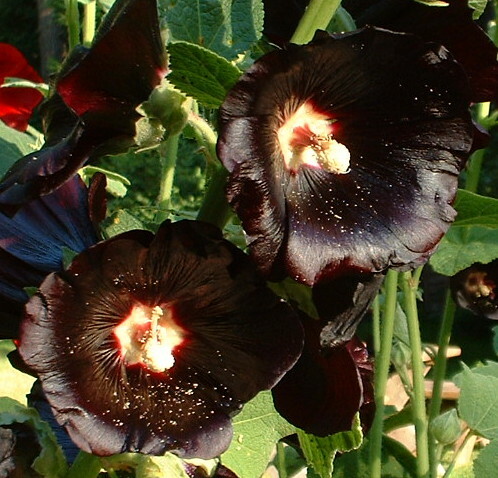 These hollyhocks are bright red or deep burgundy-black "garnet" color. Hollyhocks are in the same family as marshmallows and their herbal properties are similar. Taken internally in a cold infusion, Hollyhock soothes a sore throat, helps digestion, relieves a dry cough and promotes urination. A poultice of leaves can be used to sooth chapped or inflamed skin and to pull out splinters. Use Garnet Hollyhock Flower Essence when you feel disconnected from your spiritual heart and are ready to activate that connection. Can be helpful for upper back pain from blocked energy in the back of higher heart chakra, approximately at T-3 vertebrae. Garnet Hollyhock Flower Essence initiates the potential for the higher heart chakra (that is just below the collarbones in front and approximately at T3 vertebrae in back) to become a gateway for direct communication with the Galactic heart center, the black hole at the center of the Milky Way Galaxy. In the same way that the heart pulses the flow of blood through the human body, the Galactic Center pulses the flow of consciousness expanding time waves (called Underworlds in the Mayan Calendar) through the Milky Way Galaxy. Each of these waves introduces a higher frequency vibration that upgrades human consciousness. Garnet Hollyhock Essence initiates you into the current frequency shifts and supports you to live from this expanded higher heart-centered awareness. Garnet Hollyhock essence activates higher heart consciousness during meditation, heart-centered chanting or guided meditation, while playing crystal bowls, and other high frequency spiritually heart-centered activities. It can be taken daily in conjunction with other essences to enhance your spiritual process. Garnet Hollyhock Flower Essence was made by the no-pick method of working directly with the plant spirit. While the essence was being made, a matrix of Amber, Black Onyx, Garnet, Icosahedron Quartz, Ruby, and Drusy Quartz crystals were placed among the plants with the mother bottles. The sun acts as a transformer to step down spiritual energies from higher dimensions. While the essence was being made, Amber acted as a lens to receive and focus sunlight for this purpose. Black Onyx helps you to absorb energies that you need from the universe, grounding them with focused energy and appropriate use of power into a positive force. It fosters inner strength, focused attention, and efficiency. Garnet is a stone of devotion that aligns the emotional and intellectual bodies with the “All That Is” and sets ablaze the inner fires of self-confidence, creativity and reflection. Icosahedron cut quartz has 20 (5X4) equilateral sides. It is a bridge between the 5th Dimension - the entry into the unified Spiritual realms - and the 4 cardinal directions (N, S, E, W) on Earth. Ruby increases your life force, courage, passion and enthusiasm for life, and helps you be lovingly grounded in your physical body. Drusy Quartz crystals help to energize and stabilize your subtle bodies. The actions of these crystals inform the way this flower essence seats into your body/mind.